The current implementation of the VO Frontend is Python based. It uses a tree of process like the Factory does. ... and the glue that links the above together. The top two elements simply contact the appropriate HTCondor Collector and store the data in memory. The matchmaking procedure loops over all the Factory ads and counts the number of idle user jobs that match the attributes of that particular Factory entry point. 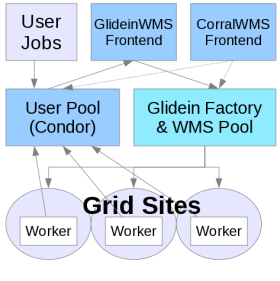 an object holding the entry point attributes, named glidein. Both objects are dictionaries, with keys being attribute names, and values being attribute values. Finally, the advertise procedure loops over the counts and converts them into appropriate HTCondor Class Ads. The glue code is responsible of parsing the input parameters, loading the configuration values and loop over the above steps. The Frontend also can handle multiple proxies. The proxy selection is handled by a plugin mechanism.